Size is in the objective lens of the beholder. Ok, so I said in my last post I was going to wait for something to mount the Galileoscope on before attempting to take an image with it. But last night turned clear unexpectedly and the full moon issued the challenge: Can you fit me on a chip? Yes, I can. Connecting the camera to the Galileoscope was straightforward. Taking an image hand-held is a trifle more challenging, basically the only way to do this is to start recording video and then pointing the tube at the object until you get enough frames that contain the object (of course, this only works for bright objects where exposure times are very short). The advantage of having a cheap telescope with a flexible plastic tube assembled from a kit becomes apparent: Easy to partially disassemble and bend to your will. After seeing an image taken with a Galileoscope posted on the Astronomy Forum, I decided to order one to play around with it myself, and to evaluate its usefulness for astrophotography. However, it turned out to be difficult to obtain one at a good price in Europe. Only a few sites had it in stock, and the cost including shipping would have been around €70 ($100). 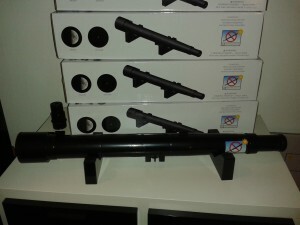 Originally introduced as a $15 telescope for the international year of astronomy 2009, it is now sold at the Galileoscope website itself in packs of six units for $150, i.e. $30 apiece. This seemed to be the most cost-effective solution, even with shipping costs of $140 added on top. The delivery arrived last week so I am now the happy owner of 7 telescopes. Of course, I neglected to consider customs for importing from the United States – another €45 ($60). Opening the first kit revealed that there was more assembly involved than I had expected: A total of 31 parts form a motoric challenge that needs to be addressed prior to first use. However, assembly requires no tools and the provided instructions were clear enough. In fact, building the scope is an interesting and enjoyable experience, and demonstrates that a refractor really is just an empty tube with bits of glass at the end. I tried the scope on terrestial objects first and later on Saturn. The first thing I noticed is that is really hard to keep anything in the field of view without a mount. And it is next to impossible while focussing the scope, which in turn makes it hard to achieve good focus. It is therefore advisable to practise while it is still light (but well away from the Sun!) when any direction will at least show you something. 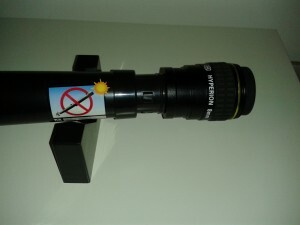 The Galileoscope is a 50mm refractor with a focal length of 500mm. Like my Celestron, it is therefore an f/10 scope. A 20 mm eye piece (with plastic lenses but acceptable quality) is provided, this yields 25x magnification and a field of view of about 1.5°. Also provided is a dual use secondary lens that can be configured as a 2 x barlow (yielding 50x at 0.75°) or as a Galilean eyepiece (upright image but almost no field of view). 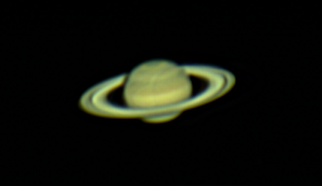 Using the barlow I was just able to make out the rings of Saturn despite the planet erratically jumping through my hand-held field of view. However, the real feature that makes this little scope more interesting than its cheap department store counterparts is that it comes with a standard 1.25″ barrel. It is therefore possible to connect all the accessories you already have or plan to splurge on. 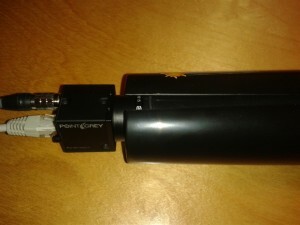 For example, below is the Galileoscope with an 8mm Hyperion wide-field eyepiece. It gives a very usable 60x magnification with a true field of view of about 1.1°. A small drawback is that the barrel does not have a thumbscrew but relies on friction from plastic ridges alone, which does not feel safe for a heavy and expensive eyepiece. Speaking of field of view, this is usually given as 1.5° for the Galileoscope. However, that is simply the value achieved with the standard eye piece and not a limitation of the telescope. A 40mm Ploessl yields a 3° FOV at 12x magnification. 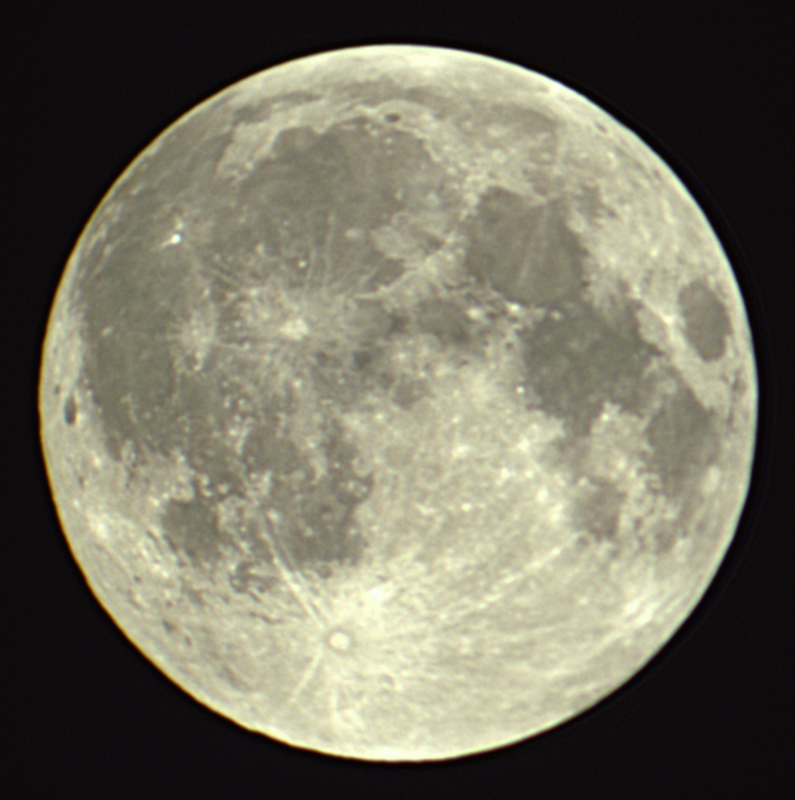 For the fun of it I tried adding a 0.5 focal reducer. At this point a limitation at about 5° became apparent but this is to be expected from the limited size of the pupil (minimum usable magnification). It would be interesting to connect a large chip camera at prime focus to determine the limiting FOV. However, this will have to wait until I manage to connect the scope onto my Celestron. A Celestron piggy-back camera adapter is already on its way, if this is successful I will most certainly post the results here – watch this space!